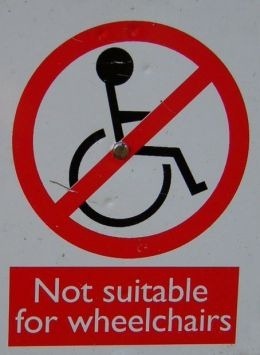 We at Planet of the Blind have received the following urgent request for solidarity and support on behalf of wheelchair users. Please read this and pass it along. “My name is Andrew Davis. I am sending this e-mail to explain what National Registry of Rehabilitation Technology Suppliers (NRRTS) is trying to accomplish and ask for your involvement as well as members of your organizations who are consumers of Complex Rehab Technology Equipment. I work with the National Registry of Rehabilitation Technology Suppliers as their Advocacy/Consumer Relations person. I am contacting you to ask for your involvement as well as the members of your organizations that are consumers of Complex Rehabilitation Technology equipment to participate in a National Call-in day to Congress we will be conducting on February 16th to ask Congress vote for upcoming legislation that will create a Separate Benefit Category for Complex Rehab Technology (Quickie wheelchairs, Roho cushions, J-cushions, alternative positioning systems) under Medicare. AS it stands now, Complex Rehab Equipment is medically coded under Medicare the same as your typical hospital type wheelchair as well as bedside commodes, walkers, etc…Complex Rehab Technology (CRT) products include medically necessary, individually configured devices that require evaluation, configuration, fitting, adjustment or programming whereas, crutches, walkers bedside commodes do not require evaluation before providing it to the consumer/patient. CRT is designed to meet the specific and unique medical , physical, and functional requirements of individuals with complex needs. CRT refers to individually configured manual and power wheelchair systems, adaptive seating and alternative positioning systems and other mobility devices. We are asking Congress to create a Separate Benefit Category under Medicare for Complex Rehab Technology. As it stands now, when it comes to medical coding under Medicare, CRT is medically coded the same as lesser quality (hospital type wheelchairs, bedside commodes, walkers, etc.) equipment and Medicare pays for the lesser value equipment which means the suppliers lose funding and could possibly have to lay people off or go out of business all together! Note: The statutory “in the home” language was originally meant to define durable medical equipment (DME) as devices that were provided outside of a hospital or skilled nursing facility and, therefore, warranted separate reimbursement under Medicare Part B, rather than Part A. However, over time, Medicare has chosen to interpret this language in a way that restricts coverage of mobility devices to only those that are reasonable and necessary in the individual’s home. “We are asking organizations and its members around the country such as yours to participate in the National Call- in-day to Congress to explain why you feel its important to have Congress vote for a Separate Benefit Category (by the time we participate in the National Call-in to Congress, we will have written legislation that we are taking to Capitol Hill). http://www.celaadvocacy.org/ Website includes Finder By Zipcode for your Members of Congress! Thanks for caring about this!